MKO - Puzzle Pattern Gold Ring for Men with Diamonds If you are looking for a unique wedding ring with great styling and an elegant design, look no further than this Puzzle Pattern Gold Ceramic Ring for Men with Diamonds. Beautifully crafted from black ceramic ring, tungsten ring, or cobalt ring, it features a diamond cut gold insert with fine diamond accents that sparkle from every angle. We offer this men’s diamond wedding ring in various widths, gold colors and diamond quantities. 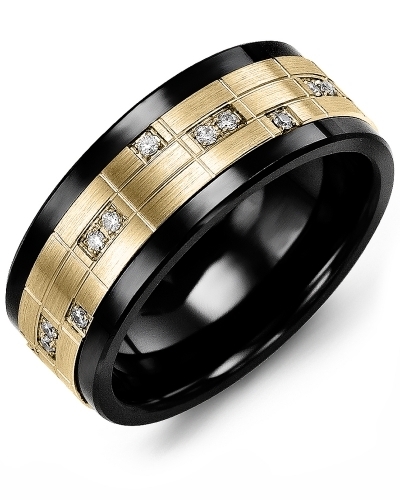 If you are looking for a unique wedding ring with great styling and an elegant design, look no further than this Puzzle Pattern Gold Ceramic Ring for Men with Diamonds. Beautifully crafted from black ceramic ring, tungsten ring, or cobalt ring, it features a diamond cut gold insert with fine diamond accents that sparkle from every angle. 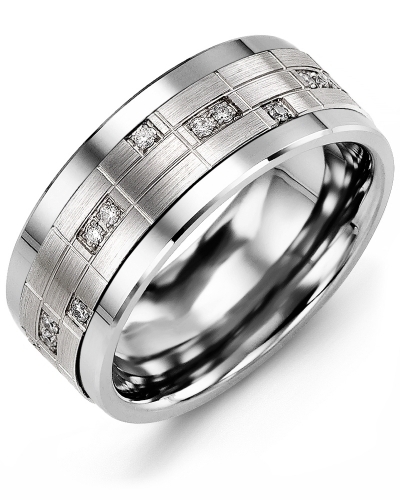 We offer this men’s diamond wedding ring in various widths, gold colors and diamond quantities. Customer service was great! I love the ring!! It looks amazing. Ordering was easy and shipping was super quick. I would definitely recommend Madani to others.